After 20 years, it's clear why the Isobar is still corporate America's most trusted surge suppressor. No other surge suppressor combines the same level of quality surge suppression components to provide maximum protection. Inside, the Isobar is packed with a dense, powerful array of components that act as multiple "firewalls," which instantaneously stop the strongest surges and filter the most disruptive line noise. Compared to other surge suppressors, the Isobar features more and substantially larger components to provide a more effective first line of defense against surges. Surges and line noise are instantaneously eliminated by multiple components working together, including Metal Oxide Varistors, Toroidal Balanced Chokes, Ferrite Rod-Core Inductors and VHF Capacitors. In addition, the Isobar, unlike other surge suppressors, provides more suppression components throughout the unit as additional lines of defense. The final safety measure is provided by Safe Thermal Fusing which protects against fire and other damage in the event of an extreme, extended overvoltage or other catastrophic occurrence. Printers and other peripherals generate harmful interference. The Isobar is the only surge suppressor that features internal barriers (Isolated Filter Banks) between its receptacles to block this interference. The Isobar eliminates noise contamination between connected equipment, eliminating computer lockups, data errors, audio static and video interference or "snow." 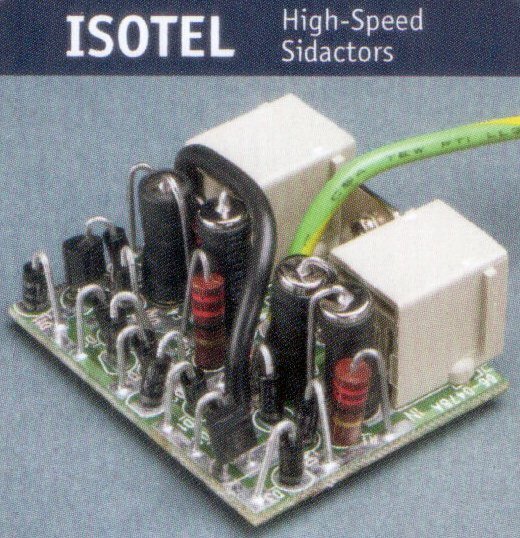 Isotel models feature high-speed sidactors to provide superior phone-line protection, as compared to surge suppressors which feature Metal Oxide Varistors (MOVs). Sidactors suppress surges faster than MOVs, before damaging voltage builds. 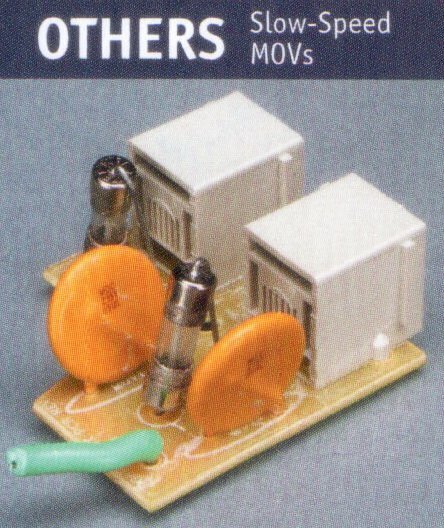 Unlike MOVs, sidactors feature extremely low capacitance and won't affect the speed of your vital communications. One important problem that arises when addressing surges is the point at which they occur along the sine waveform; surges that occur at the lowest point on the waveform (270º) have more room to build up to destructive voltage. The Isobar solves this problem with the large, heavy-duty Ferrite Rod-Core Inductors added into the design of its multi-component surge array. The inductors closely track the sine wave form, providing a consistent, high level of protection regardless of where the surge occurs on the waveform. The Isobar's Inductors consistently limit surge let-through voltage to an extremely safe 35V. 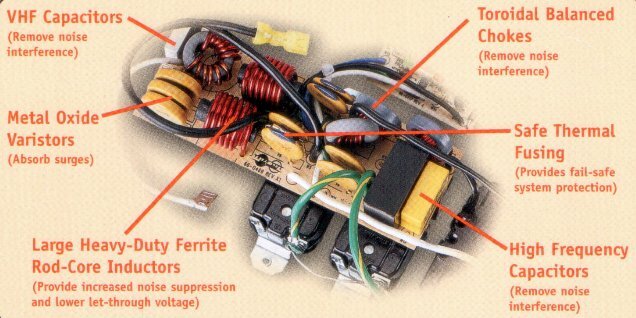 Basic surge suppressors, on the other hand, do not feature Ferrite Rod-Core Inductors; instead, they rely solely on Metal Oxide Varistors (MOVs). MOVs engage surges at voltage levels preset well above and below the sine waveform. With such a wide suppression threshold, basic models allow surges to build destructive power to varying degrees. When surges strike at the lowest point on the waveform, basic models' MOVs allow potentially damaging let-through voltage to build up to 400V or more. In order to provide your valuable equipment with the highest level of protection, the Isobar is designed to outperform the highest safety standards in the industry. The Isobar has the highest UL-verified Joule ratings. It provides UL-verified Joule ratings up to 2850 and amp spike ratings up to 92,000 -- the highest protection level you can buy! The Isobar has the best UL let-through rating. During UL 1449-1998 testing, the Isobar was subjected to repeated 6,000V surges (much stronger that the average surge) to gauge how much energy was "let-through" to connected equipment. The Isobar passed the test with UL's best let-through rating on all three lines -- 330V. Although 330V is the best rating UL allows and is considered an acceptable surge tolerance for computer equipment, the Isobar surpasses even this high standard, providing less than 35V let-through on average (when subjected to an IEEE 587 Cat. A Ringwave). Other surge suppressors have been found untested and unsafe. Approximately 2 million surge suppressors and related products sold since 1994 have been recalled for hazards ranging from fire to electrocution. This is based on U.S. Consumer Product Safety Commission recalls between 1994 and 1999. Furthermore, a U.S. Consumer Product Safety Commission investigation in 1997 of U.S. discount stores, mass merchandisers, hardware chains, etc. found that 72% of surge suppressors and related products currently on the market fail to meet safety standards.